This is a simple salad to make and especially good in the summer months as it is light but can easily be turned into an entire meal. 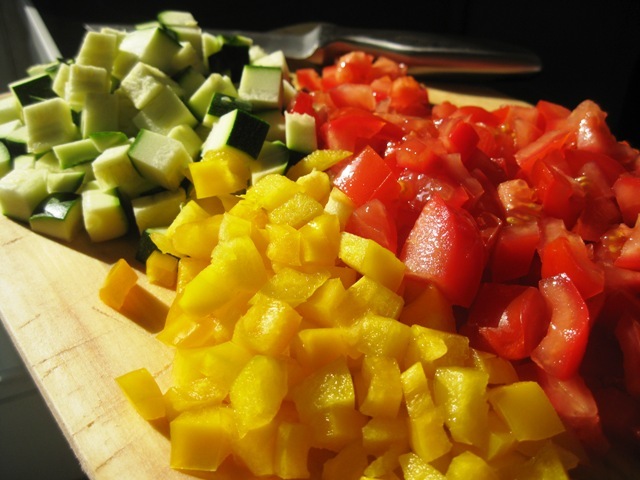 The recipe calls for only one yellow pepper, but I often add red and green as well. I usually simmer everything for a bit longer than 5 minutes as the peppers still tend to be quite hard. Also, don’t be shy with the olive oil – depending on how many peppers you use, it’s a good idea to douse them liberally. A few vegetables “of the sun”. I love to see the mix of these vibrant vegetables, and I also chose to start off our recipe series with this post as ratatouille is the quintessential dish of Provence. Hope you enjoy this spin on a traditional Southern favorite. Bon appetit! 1. Cook rice as directed on package. Drain and place in a bowl. 2. Wash and dry vegetables. Remove the ends of zucchini and cut them into small cubes. Cut 2 tomatoes into dice. Open the peppers in half, remove seeds and white parts. Cut into small cubes. 3. 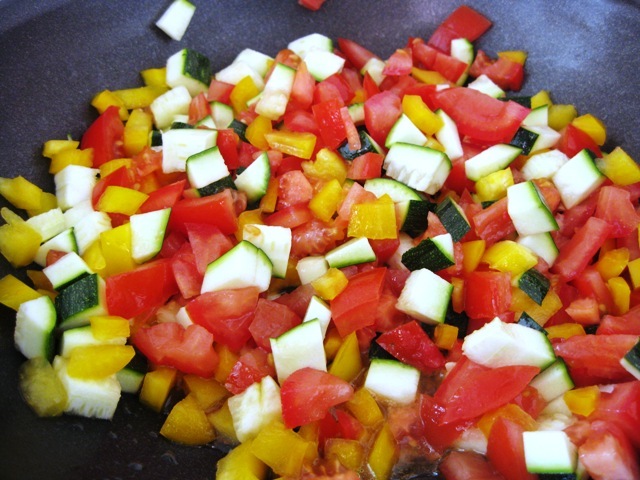 Heat the oil in a pan and simmer all vegetables for 5 minutes. Gently stir in vegetables with rice; salt and pepper to taste. 4. For the dressing, squeeze the lemon & add its juice to the with olive oil; salt and pepper. Pour the dressing into the salad bowl and toss gently. 5. Divide salad among 4 serving bowls. Decorate with sprigs of thyme (optional). Serve immediately. This gives a whole new meaning to Southern cooking Tuula! Looks great and thank you for sharing.